Back to school today! It was a busy, but amazing break. I almost wish there was another polar vortex so I could have an additional day or two for an actual break. I still haven't learned and continue to try and cram the most amount of activities into it possible. Just this past Saturday we had Claire's second birthday party. I plan on doing a full post with pictures later this week. Her favorite book is Chicken Soup with Rice so I planned decorations and food around the book. It was absolutely adorable, very unique, and so perfect for Claire. I can't wait to share more! See how else I've worn this top here, here, here, here, and here. I can't believe break is over! It was a long one, and I feel refreshed, but I know what you mean about being busy and cramming as much as you can into it! Can't wait to see how Claire's party turned out! Loving your outfit girl!! You are so stylin'! My daughter was hoping for another polar vortex this morning! I don't think anyone is ready to go back! I love this layered look and that blue bracelet is darling! hope your first day back is super awesome!! Love the peep of plaid, cute outfit. That touch of plaid is absolutely gorgeous! I love it Laura! Happy birthday to Claire! Can't wait to see the photos. Loving the prep look. Aww glad you had a great break and got to celebrate a fun birthday with your muchkin :) You look great in this color combo!! Love your layered look. Sounds like such a fun birthday party. Can't wait to see the pictures! Sounds like you have been busy. 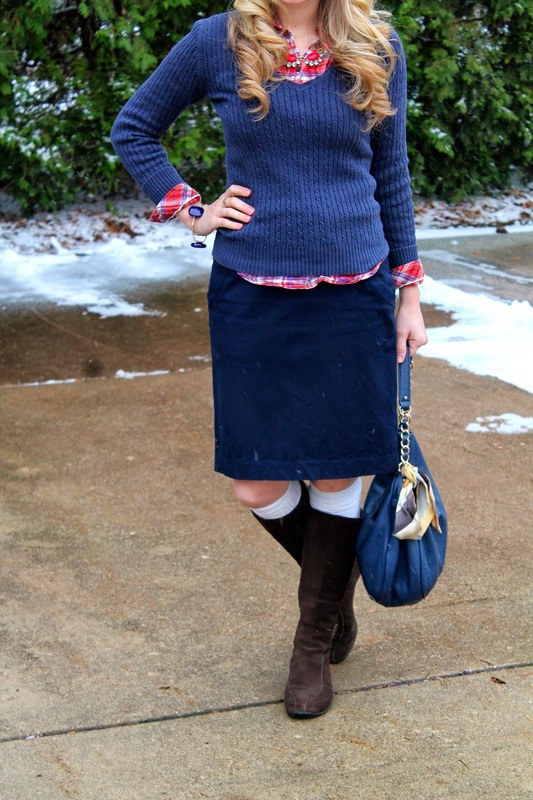 I just love the navy colors with the hints of red plaid! So pretty! We just got some flurries here, nothing stuck... can't wait to see the post about the birthday party, the theme sounds too cute! I love that combo! That plaid is such a great print and i love your skirt as well! I love the plaid layered underneath this sweater. Beautiful skirt too! Such a cute and cozy look! I love the colors, and the socks! So pretty in navy! Happy birthday to Claire, such a cute party theme, can't wait to see the pictures! Pretty look, Laura! You are the master of layering!! I love it! Before even reading this post I was going to ask about Claire's second birthday, for you to share pics etc. Love how the skirt looks here with the boots+socks combo which I haven't done in a long while. 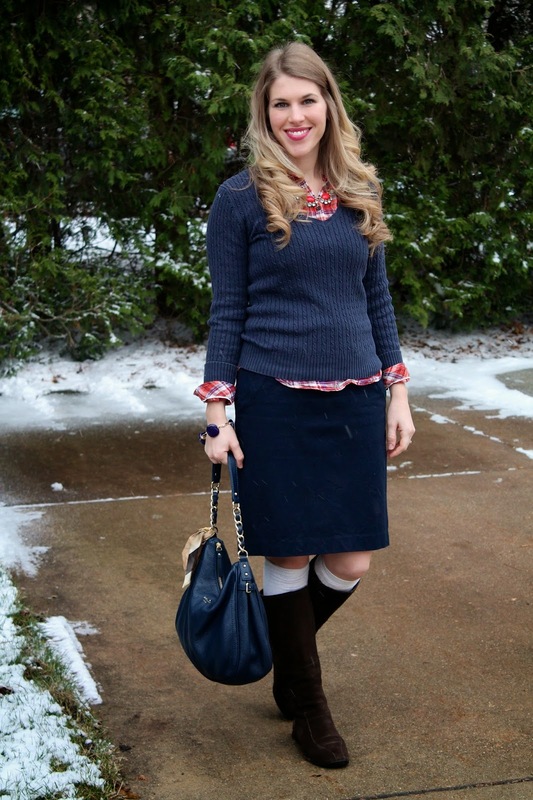 The navy and plaid are a great combo! Can't wait to see the birthday pics! Now, now, polar vortexes are not something you should wish for! Hope you've had a good week back! This layered look is fantastic Laura! Although I'm freezing just looking at your bare knees! I'm such a cold-weather wimp that I won't be showing bare skin until the temps are at 80 and above!